WHO ARE THE MEMBERS? - Anyone can be a member and it's FREE to Join. 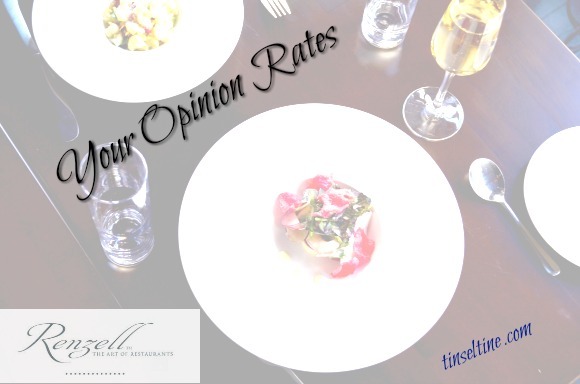 You just have to be someone interested enough in dining out that you'd be willing to give your opinion to Renzell on your experience, in order to earn points. WHAT DO THE POINTS GET YOU? Every month Renzell holds a special tasting at a Philadelphia upscale restaurant for members who have earned enough points to attend. It becomes both an exclusive invitation and a reward! WHAT IS TINSEL & TINE GIVING AWAY? as usual, free promotion :) In fact, the above breakdown is my own wording and I think I did a pretty good job with the FAQ, And guess what? I'm not even invited to the first event in Philly :( HOWEVER, I'm happy to feature Renzell this month because I do think it sounds like a fun, foodie kinda club to join! And it's great that Philadelphia is one of the 11 cities chosen for their roll out, and because T&T is about highlighting interesting stuff about film/movies, food/dining and Philly for my readers, subscribers and followers... and I do think Renzell's mission to create the most accurate, objective restaurant ratings in the world is interesting. OK, WHAT'S TINSEL & TINE REALLY GIVING AWAY? 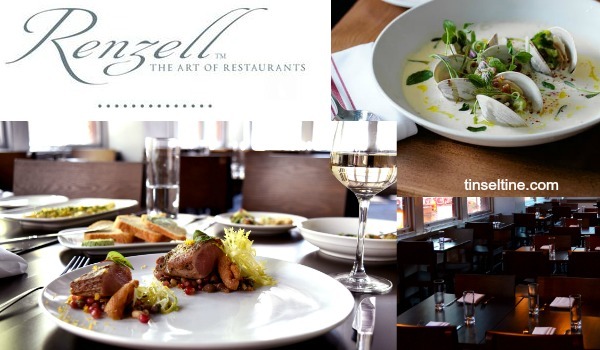 Details: The Winner (2 tickets) will enjoy a multi-course tasting to join Renzell Members as they celebrate their launch in Philadelphia. Private Tastings include a pre-dinner cocktail, a tasting menu with wine pairings, coffee or tea, and water. (Additional food or drink can be purchased at your own expense). Aldine Cuisine: American - a bit brooding and industrial, Aldine sits on the second floor of a walk-up, affording it some nice views of the surrounding neighborhood. Hipsters and non-hipsters alike will be inspired by the elevated and complex seasonal small plates—many of them vegan or gluten-free—that they enjoy to a soundtrack lifted straight from the 90s. Renzell is a new membership club for dining enthusiasts looking to change the way restaurants are rated.